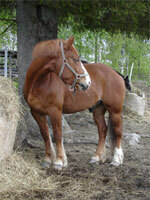 The Ariegeois horse breed is one type of animal that can be used for endless purposes. For example, many have used them for agricultural jobs, harness duties, and packing or carrying. They can be used for show in competitions, though that rarely occurs. Very kind animals, they can be gentle enough to have a bird perched on them for hours of companionship. 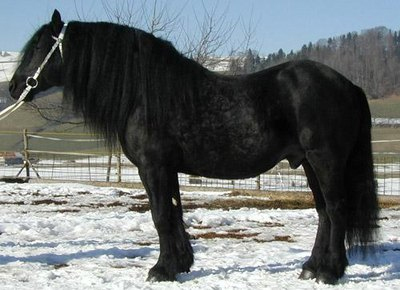 Typically, the way most can recognize a horse of this breed is by their signature black color. The Ariegeois breed can be a very simple animal to tend to on a daily basis. 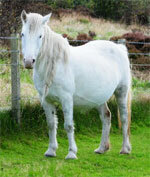 They are very hardy and considered to be quite docile creatures for horses. Most owners have remarked that this breed is easy to keep and generally a very pleasant animal. Standing at around fourteen hands in size as adults, the Ariegeois horse breed is considered a small but quiet tyep, for the most part. They bode a refined head and a long neck that is strong, with rounded quarters to boot. They also have hard feet that are great for traveling long distances without any injuries. 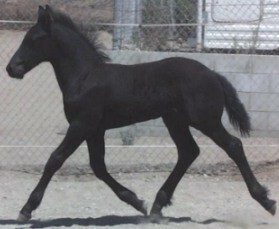 Almost always you will find this type horse in a black coating, sometimes a very dark brown, though very few can also have markings that are white in color. Their tails are set low and they are also known for having strong chests and strong shoulders. 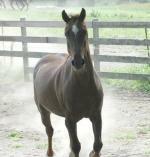 Ariegeois horses are fair tempered and very gentle, so caring for this horse will not require too much. These animals are extremely resilient and have the ability to mostly care for themselves. They can also travel long distances and not endure very much damage or injuries as in other breeds that may not be strong or disciplined as the infamous Ariegeois style. Originating in France and Spain, the Ariegeois horse is considered a mountain horse breed. They have even been a matter of discussion for one Julius Caesar, who made it a point to mention these fine creatures in the Commentaries on the Gallic War. 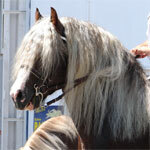 They have received their mane from the Ariege River, which is situated on the French Pyrenees. 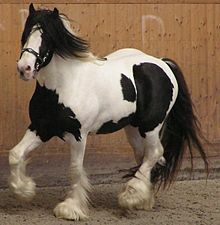 One of the main three variations of ponies that have derived from France, along with the Pottok and Landais breeds. They are commonly mistaken for the Dales breed and also the fell ponies that are infamous in the area of Northern England. They are mistaken for these other types simply based on their predominant black coats. They do not bode any clear markings which can make a breed more recognizable to the general public. Their primary uses have transformed greatly over the past few years, but all in all they have notoriously been linked to those aiming to swindle in goods from France to Spain and vice versa.